Item # PRM, Process Pump ANSI to API 685 series PRM On Dickow Pump Co. The containment shell is a designed pressure vessel to separate the pumped liquid from the atmosphere only. The shell is not used as an additional bearing holder. Therefore, no dynamic stress occurs. Besides the standard containment shell with can, made in one piece, a containment shell of "sandwich design" is also available. This design will be applied at pump speed 2900/3500 rpm and motor ratings above 75 kW in order to reduce magnetic losses. Different from the conventional design, this sandwich containment shell consists of two shells. The inner shell which accepts the radial loads consists of centered rings. These rings are insulated from each other by confined Gore-Tex-PTFE gaskets and preloaded by a wave spring to avoid any leakage. The outer shell consists of a slotted pipe with bottom and adapter flange welded to it. This shell accepts the axial loads generated by the pressure p5. This design - together with a special magnet assembly - reduces the magnetic losses by approx. 50%, compared to a Hastelloy C containment shell of 1.0 mm (0,039") thickness. The maximum allowable working pressure is 35 bar at 200°C (500 psi at 390°F). 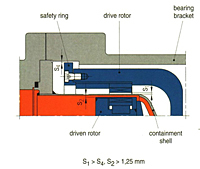 The clearance between the rotating drive magnets and the stationary containment shell is larger than the clearance between the rotating safety ring and the bearing bracket. This prevents containment shell rupture in case of ball bearing failure. Due to the radial clearance S2 > 1,25 mm the pumps can handle non-metallic (non-ferrous) particles in the fluid up to 1,0 mm. If desired, a mechanical stand-by seal can be supplied in lieu of the inboard labyrinth seal. 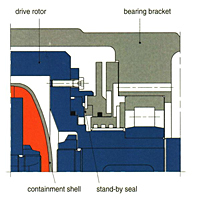 This mechanical seal separates the magnet area from the oil bath respectively the atmosphere and forms, together with the closed bearing bracket lantern, a secondary containment behind the containment shell. In case of leaking containment shell, the pressure inside the bearing bracket will increase and activate the seal. Leakage will be collected at the bottom of the bearing bracket and can be monitored by level detection device. The pump shaft is carried by two sleeve bearings. These bearings are located in the pumped liquid. Bearing material is pure alpha grade Silicon Carbide. SiC is corrosion proof to all kinds of acids and hydroxides and suitable for all common pumped liquids. Extreme hardness and wear resistance accept also abrasive solids. An additional "diamond like Carbon coating" reduces friction losses and accepts dry running conditions until monitoring device will switch off the unit. The SiC-bearing parts are shrink-fitted in metallic holders or elastically beared by metallic tolerance rings. This protects the bearing unit against shock or thermal stress, caused by different thermal expansion of metal und ceramic. Design temperature is 400°C. Both stationary sleeve bearings are located in the common bearing housing which guarantees absolute centricity. The outer magnet shaft is fitted with generously dimensioned antifriction bearings. The bearings are L10 rated for an average life in excess of 3 years. The oil bath is protected against the atmosphere by a replaceable labyrinth seal. Oil level is controlled by a constant level oiler and additionally by a bull's eye sight glass. Oil mist lubrication available as an option. The PRM-pumps are end suction, top discharge, single stage, radial split volute casing pumps of back-pull-out design with closed impellers. The mechanical design meets the API 685 requirements. The bearing bracket design allows the removal of the complete unit including outer magnets and ball bearings without depressuring the pump or exposing the pumpage to the atmosphere. 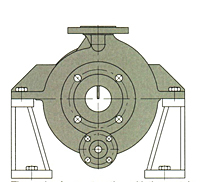 The volute casing of standard design is cast en bloc and centerline supported. The casing forms - together with the containment shell - the pressure retaining pump unit. Maximum allowable pressure at PT is determined by the shell design and the material. The pump casing has metal-to-metal fits with confined compression controlled gaskets. Pump flanges are full or spot faced on the back and designed for through-bolting. The single elements of the multipolar magnetic coupling are permanent-magnets made of "Cobalt Samarium - Rare Earth". Power is transmitted by a magnetic field, built up by the outer and inner magnets, through the containment shell. This kind of magnetic coupling works synchronously without slip and transmits the required torque to the impeller. The magnetic couplings are designed to transmit rated motor power up to 160 kW (217 HP) at 2900 rpm, respectively 195 kW (265 HP) at 3500 rpm. The couplings are sized to fit the maximum power consumption of the rated impeller and allow also at least 5% increase of the installed impeller diameter. If nothing else is foreseen, the transmissible coupling power, the rated motor power and the available moments of inertia are sized for direct-on-line starting of the electric motor. In the magnetic coupling, eddy currents are generated which lead to heat and cause temperature rise of the containment shell. To dissipate this heat and to cool the sleeve bearings, the PRM-pumps use internal cooling flow with pumped liquid as standard. 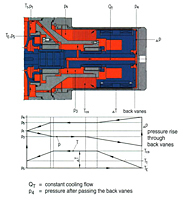 The cooling flow is led from the discharge side behind the impeller into the chamber between the slide bearings and through the pump shaft via the rotor back vanes again to the discharge side. This design pressurizes the slide bearings and the containment shell with nearly the full discharge pressure and the product remains stable in this area. The internal cooling flow works without auxiliary piping, no additional thread or flange connections are available. External circulation from discharge flange through magnet end or external flushing will be available as an option. Thrust loads of the closed impellers are balanced by wear rings, impeller balance holes and the rotor back vanes. The pump shaft, connected to the impeller is floating. During operation no thrust loads are available, no thrust bearings are required. Start-up rings keep the shaft unit in position at start-up and at shut-down. Renewable wear rings are furnished on both the casing and the impeller. Front and back wear rings are part of the axial balancing system. Mating wear surface materials have a difference in Brinell hardness of at least 50 HB. Thread connection for containment shell surface temperature probe is standard. Bearing brackets have threaded M8 connections for permanently mounting vibration transducers. The complete pump can be drained by the drain connection at the bottom of the volute casing. There is no separate drain connection in the magnet end. The PRM-pumps are self-venting. No air or gas will remain in the magnet end when filling suction and discharge pipe. Exception is taken for PRMW HTM-pumps.